In 2004 Ella volunteered in different mission activities through the youth programme of ECPM. In 2005 Youth in Missions for Christ was created as the youth missions arm of ECPM. Because of her passion to minister among the youth, ECPM asked Ella to be part of the YMC core that organise and plan the programme for YMC. In 2006, the YMC Campus Ministry was started and Ella took on the role of Coordinator of the Campus Ministry. 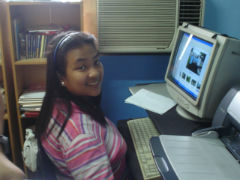 She now coordinates the training and campus evangelistic activities of the two campus ministry teams. Her role also involves media / website and communication / resource writing and development. She is also involved in teaching in the church planting training and is keen to develop a framework for pastoral care for church planters. The partnership goes back to the days of Len and Mary Savill being missionaries in the Philippines. They introduced us to ECPM, a church planting movement. BHW has been supporting this partnership for a number of years. This partnership provides financial support for Ella Santos enabling her to fully devote her time to the YMC Campus Ministry. Ella has such a passion for youth and a real desire to minister to the young people in the Philippines, training and encouraging them to share their faith with others on campus. 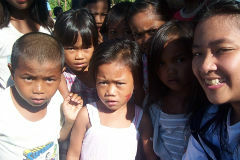 She realises the importance of training the next generation to stand-up for Christ. After training Ella worked as a freelance architect for five years before joining ECPM. Before any involvement in ECPM she was actively involved in the youth ministry of her church, Sumapa Christian Church in Malolos, Bulacan. She is passionate about youth and is like a big sister to the young people. Many youth and parents trust her and she is like a mother to them. She is a person everyone can count on. The most rewarding ministry for her is reaching those who are unreached by training people to go out. To encourage young leaders to work hand in hand with their church leaders in the area of mission. To train up young people and enable them to impact the lives of university students. 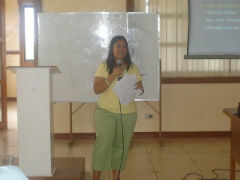 Ella has also become more involved in training seminars for the church planting teams. She goes with other team members. I am really amazed with what is unfolding right before my eyes. God has been with me all throughout and I can never fathom His work in me and in my heart. Looking at the diversity and complexity of all these things, we at YMC could never really have done it without God's amazing grace. I have depended more on Him and I cannot even explain the kind of love I more and more feel from Him. All this is not really easy but if there's one great impact on me, it is seeing more the greatness of His power and the wonder of His love in my life that enables me to survive. He is the morning sun that makes me stand up each day and gives me more strength in facing my own giants. He is the fresh dew that helps me see hope, joy and the good in everything I go through. He is the raindrops that make me feel the warmth and comfort there is in His loving arms.